The East Central Regional Arts Council (ECRAC) determined that our region has many young, talented, and energetic artists deserving acknowledgment! As a result, the ECRAC, with funding appropriated by the Minnesota State Legislature, decided to offer these gifted young artists a Scholarship opportunity to assist their promising futures as artists. The East Central Regional Arts Council is pleased to offer Scholarships in amounts not to exceed $500 to any student in high school, middle school, or elementary school intending to enhance their artistic talents. The deadline for application is March 1. The student must live in one the following counties: Chisago, Isanti, Kanabec, Mille Lacs or Pine in Minnesota. This is not a Scholarship program for college credits nor is it meant to replace regular artistic classes or training for homeschooled children. This funding cannot be used for travel or projects outside the State of Minnesota. This funding is targeted to fund special art projects or programs for kids. All scholarships must be completed by December 31 of the application year. 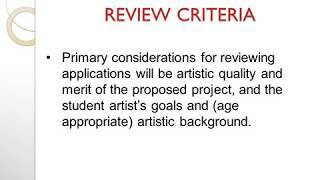 Primary considerations for reviewing applications will be artistic quality and merit of the proposed project, and the student artist's goals and (age appropriate) artistic background. Application materials needed are the Scholarship Guidelines (available for download as a pdf at the bottom of this page) and the ECRAC Online Grant Portal (directions below). At least three Scholarships for kids are available from ECRAC this year. This is a competitive program. The student must live in one the following counties: Chisago, Isanti, Kanabec, Mille Lacs or Pine in Minnesota. This is not a Scholarship program for college credits nor is it meant to replace regular artistic classes or training for homeschooled children. This funding cannot be used for travel or projects outside the State of Minnesota. This funding is targeted to fund special art projects or programs for kids.